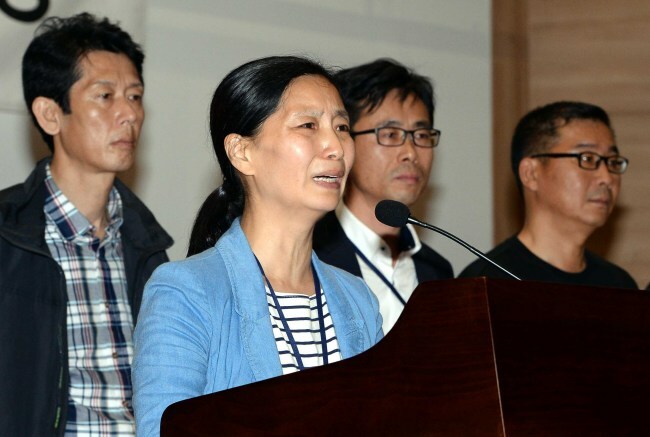 South Korean investigators are paying attention to the coming decision of the French court as to whether the country’s judicial authority will approve repatriation of the eldest daughter of Yoo Byung-eun, the de facto owner of the sunken ferry Sewol. While Korean law enforcement authorities are pinning their hopes on the possibility that the overseas court will soon lock up Yoo Seom-na, who was arrested near the Champs-Elysees in Paris on Tuesday, a key issue in the coming days will be whether the human rights-minded country will accept Korean investigators’ request to turn over Yoo to her homeland. France is one of the few countries whose human rights protection of suspects or culprits far surpasses the world norm. Further, there have been no criminal repatriation cases between the two countries. Yoo’s daughter has been suspected of being paid shady funds from an affiliate of Chonghaejin Marine Co., the operator of the ill-fated Sewol, when she was the chief of a design firm. The Korean police filed an Interpol red notice against two of the irregularity-ridden business tycoon’s four children last Friday. Should the French court choose to repatriate her, it is expected to keep her locked up for a maximum of 40 days, and France’s justice minister will decide whether to hand her over to Korea. The 47-year-old woman may be released under the country’s judicial watch. The Justice Ministry of Korea on Tuesday vowed to attain the French judicial authority’s active collaboration by sharing some key allegations against Yoo Seom-na and her father Byung-eun. Later in the day, the prosecution asked the Incheon District Court to freeze the wealth held by the Sewol owner Yoo and his three children in a bid to prevent them from stashing away cash or real estate holdings before the coming indictment or trials. Though their illicitly gained wealth is estimated to reach 240 billion won ($228 million) including the assets allegedly under borrowed names, prosecutors’ initial target ― filed with the court ― stood at 16.1 billion won in bank deposits and stocks’ market capitalization, which were verified through real-name accounts. Prosecutors’ “ultimate” target of 240 billion won includes an estimated 129.1 billion won held by Byung-eun, 49.2 billion won by Seom-na, 5.6 billion won by the 73-year-old business tycoon’s oldest son Dae-gyun and 55.9 billion won by the second son Hyuk-gi. When their assets are frozen under the law, they are banned from selling off real estate property or withdrawing money from financial firms. While the prosecution has yet to arrest the owner of the sunken ferry despite nationwide raids over the past few days, financial authorities have stepped up the effort to cut off the cash flow of Chonghaejin Marine and dozens of its sister firms. With more business malpractices of Yoo and Chonghaejin Marine group being revealed, the National Tax Service recently confiscated the collateral offered by Chonghaejin and two other affiliates to creditors. As the collateral has been seized by the state tax agency, the three firms are obliged to pay their outstanding debt worth 59 billion won to the state-controlled Korea Development Bank. In addition, loans worth 90 billion won out of the 280 billion won in loans issued by the banking sector to the group mature by the end of July. If some core affiliates become delinquent borrowers by failing to pay their debt, the Chonghaejin group could face insolvency and management by the court. Under instructions from the Financial Supervisory Service, some commercial banks are poised to reject the extension of maturing loans or raise lending rates, citing a downgrading of the group’s affiliates’ credit standings.